Have you been making ice cream or perhaps zabaglione recently? If yes, then you're left with lots of egg whites. Last weekend we had blackberries with zabaglione at friends' place, and were left with 6 egg whites after that. K. had already made the most beautiful macarons for the New Year's Eve party (see Flickr photo set here), so I had to come up with another idea. Meringues or pavlova are always an option, but then I remember an egg white cake recipe my schoolmate Kristel had shared on my Estonian site, where it had got good reviews. I decided to give it a go. And it was lovely. Very simple to make (especially with the help of my trustworthy KitchenAid Stand Mixer), and I loved the dense, moist and small crumb of the resulting cake. I made a plain version, but would consider adding some Nielsen Massey Madagascar Bourbon Vanilla Extract or real vanilla seeds, or perhaps couple of drops of Boyajian pure orange oil next time.. In any case it's a good recipe to have on hand when you've got lots of egg whites but don't feel like making meringues..
Whisk the egg whites with 2 Tbsp of sugar until thick and pale and very foamy. Mix the rest of the sugar with flour, potato starch and baking powder, then sift into the egg mixture and fold in gently. 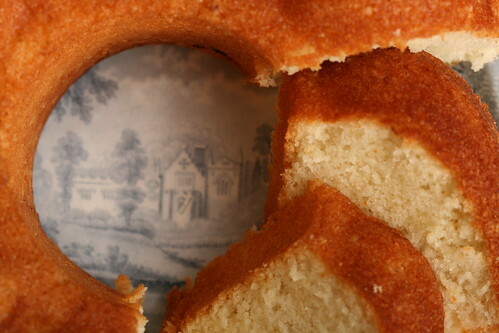 Pour the batter into a buttered bundt-form and bake in a pre-heated 180 C oven for 30-40 minutes. Test for doneness with a wooden toothpick. I love you recipies, and get so jealous when I see the ones on yr estonian site. Translate, translate please! I always bin mine when not needed so it's great to find a use for them! Fantastic! I've had some egg whites in the freezer for ages that have been waiting for me to get round to doing meringues - this looks so much easier :-) Thank you! Scott - I used to bin them, too, but now make small meringues or a pavlova - or a egg white cake! Jo - it's easier indeed! Kavatsen proovida, aga eelkõige - ülemine pilt on väga lahe! I had googled egg white recipe and I tried this because I don't like macaroons and this was AMAZING. So delicious. Great recipe, thank you so much. greetings from canada! i made a pile of creme brulee and want to do something other than tiresome old angel food cake with all my yummy whites so can't wait to try this. one question: when you say corn flour, would that be corn starch in north america? they are two different things but i am led to believe that in england when corn flour is mentioned, it is actually what we call corn starch here so i wonder if it might be the same in estonia. Well, many thanks for the super recipe. I had 10 egg whites left over from a std yellow cake recipe. So I adjusted the recipe a bit and cheated - adding 1tsp of rasberry extract and putting my mother-in-law's homemade rasberry-blackberry jam in the middle... much of the jam sunk during cooking making a caramelised bottom... so the kids and i decided to turn the cake upside down - rave reviews from everyone. Many many thanks to you and Estonia. Best cooking regards, Valerie (American settled in Paris). Can't wait to try the other recpies. Hello, I did it! It is delicious ! I've make some changes but not very important :). Thank you very much for your recipe ! Here is the link , is in Romanian. How about adding orange flower water? How much could I get away with? Excellent recipe, by the way. Rebecca, Valerie, Amalia - so glad that you enjoyed it!! Kathy - I haven't used orange flower water. But if I'd use orange oil (Boyjan), then half a teaspoon max - it's a pretty potent stuff.. It's lovely to find that I can bake a cake with egg whites. I just did a batch of Vanilla Thins (some call Cat's Tongue), but in my hot country, it's never come out quite pretty. Thanks for sharing, I will bake the cake soon! Really delicious! Though it was a tad too sweet for me. Would use 160-180g of sugar instead. After making a lime tart recently I had seven unused egg whites left. I made your cake, with some vanilla extract and topped off with some lime-flavoured icing. Delicious! I would never have thought that a cake could be made this way. Thanks very much for the recipe. thank you for the beautiful recipe! It was so popular that I've made it twice in 3 days! Thanks for this awesome recipe. Unlike most of my baking, this came out beautifully the first time! I'm sure it will go well with the ice cream that left me with so many whites. Just made this awesome recipe ...such simple ingredients. The result is a very fragrant cake with great texture. A wonderful coffee cake which I'm now enjoying with my latte. I'd love to make this cake but havent got a bundt form tin so will have to use a regular round tin instead - would you recommend using a 7", 8" or 9" round tin please? Great recipe. I've tried it without the butter too and it is really delicious. I use the idea of putting a ring of jam (more of a sauce type jam) in the middle at the end just before putting in the oven. Wonderful. I also use some almond oil in the batter. I don't have a bundt pan anymore so I use an angel food pan an it works great. have leftovers and didn't want to do meringues. Google what to do with egg whites and found your blog! Thank you for sharing! I discovered your blog while looking for egg white recipes today after being left with tons of egg whites from making ice cream. The cake is scrumptious and I'm loving your blog!! 2 tbl softened cream cheese, 2 tbl buttermilk, 1 cup confectioners sugar blended into smooth glaze. Dipped cupcakes into glaze. Butter is 7 Tbl, flour is 1 1/4 cup, and sugar is 3/4 cup + 1 Tbl. I used regular granulated sugar, no texture problems. This is a great contribution to solving the egg white dilemma! Thank you for sharing it! It must be "fool" proof if I could tinker with it and get a good result! I found the comments of other tinkerers helpful to make a breakfast version with plenty of protein and some fiber. I considered adding flax meal but opted for nut meal. It was very good. It had a slightly dry character, a fine crumb, so it called out for whipping cream/yogurt and fruit! Baked at 350 as a bundt cake - 25 minutes? I don't know how long - until done. It was not easy to fold the dry ingredients into the whites. It came out fine even so. I love this recipe as I always have leftover egg whites from making ice-cream! I quite often make friands with them, but this is a nice break. I also added sliced apples halfway through the mix last time and it was lovely...might add a bit of cinnamon next time as well! I'm so glad I found this recipe, I no longer feel I have to make a pavlova everytime I'm left with egg whites. Made it with four egg whites and adjusted the other ingredients to 66% of original. Next time would put baking paper on base of tin - needed a really good shake to get cake out of tin - but was still in one piece :)Love the texture of the cake. I made this using brown sugar instead of white (I was out.) It was delicious! Now I am thinking I could substitute some of the butter for chunky applesauce, add some cinnamon and have a nice, fall apple cake! Thanks for the recipe! I LOVE this recipe. I've been using this cake as the base for a wide variety of fillings and frostings. Thanks for publishing it here. Hello - Just to let you know that I have linked to this recipe from my blog memykenwoodandi. Thanks for the recipe! Tried it yesterday with vanilla essence and almond essence added and with a little less sugar. Came out really well! Great recipe! Thanks for posting. We make homemade ice cream weekly and always have a dozen egg whites left. I used a cardamon spice mix I had from cookies the first time, really good. Today I used vanilla bean seeds. Really good too. Such a good base for experimenting with flavorings. Very different than the angelfood cake I usually use. Tonight we'll have some with homemade orange sherbert. I really reccommend this recipe. Thank you for this recipe... Love it! I just made a batch of ice cream and had just nice 6 egg whites left. Made your recipe with 2 modifications. I cut the sugar down to 180g and added zest of 3/4 lemon. It was so good! You totally don't miss the yolks! One of my most successful cakes ever. Thanks! Wonderful cake. nothing like angel cake, and thank you for that! I added 1 tsp of lemon oil extract. Fabulous results. I will add more than the 6 egg whites next time, and bake in a cake pan or muffin cups. Would be wonderful muffins with afternoon tea and jam. I'm usually a baking disaster zone but even I couldn't mess this up, despite forgetting the cornflour. It is much less 'crumbly' than I expected - really moist. It looks gorgeous too. Thank you! Great idea! Thank you for sharing. As another commenter said, a nice alternative to angel food cake. I used white whole wheat flour and it came out wonderful. I'm thinking of all the delicious liquors that could be added in the future ... keep up the great work!! Lynn - did you enjoy the cake? Anon. - I'm sure it's ok to reduce the amount of sugar a little. Steve - lime-flavoured icing on top of the cake sounds like a great idea!! Karen - ehee - it's the most viewed and commented recipe here on Nami-Nami :) What did you do with all those leftover egg yolks?? Jamie - thank you for your kind words. I'm glad this recipe has been a rewarding one! Sching Ng - thanks for sharing! Debs - I'd probably use the 8-inch one. Beth - that "jam ring" idea sound fabulous. Must keep that in mind!!! b.hoffner - I've made it with vanilla extract myself, or with orange oil - as the cake itself if plain, it's open to all sorts of flavourings. Cupcake idea is great! Mark Boxshus "Cookie Doctor" - the the comment above that converted the measurements. Anonymous - I love this recipe too :) I must admit I only discovered friands recently, but now regularly make friands as well, when I have leftover egg whites. Anonymous - I love the idea of using brown sugar instead - I can imagine the lovely caramel hue of the finished cake! Abra - thank you for trying and reciting the recipe! Mingo Flamingo - thank you! Anonymous - great to hear! Anonymous - glad you enjoyed this! Raina - and thank you for sharing and linking back! Deforest Farmer's Market - somebody tried using this for cupcakes and it worked well! I made this cake yesterday, frosted it with whipping cream and piled raspberries on top and it was delicious! Will definitely make it again, but would like some more specifics on what state the whipped egg whites should be in prior to folding in the dry ingredients and the butter - prior to soft peaks, soft peaks, stiff peaks, or stiff and dry? I didn't understand which of these was meant by pale and thick. Thank you. Thank you for this recipe! I tried it and it is really good!! My family and I love lemon curd and our tree just produced a couple hundred lemons again this year but everyone is getting sick of the meringue and pavlovas I usually make with the leftover egg whites. My curd recipe leaves me with 6 whites so this was perfect. My little sister loves rose syrup as cordial so I decided to flavour with that. I added a large splash of it after the butter before folding and as with the dry ingredients I found it a bit tough to mix thoroughly while being gentle to the fluffy whites but I managed to mix it enough that it didn't have any noticeable lumps and tasted great throughout without loosing too much volume. Thanks for the wonderful recipe which I'm sure I will repeat with various flavours. I just made this cake, and I am tasting it right now! It's awesome! Quite dense, but in a good way, very soft, tender, and buttery. 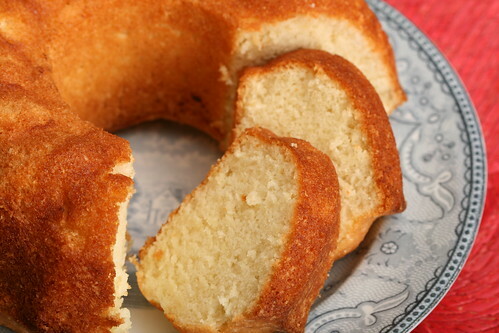 It tastes like a nice cross between a pound cake and an angel food cake. It is very easy to make too. I doubled the recipe (used 12 egg whites), because I have a very large bundt cake mold, and because I had a ton of egg whites in the freezer. (I like making lemon tarts and lime tarts, and lemon curd uses a lot of egg yolks.) It baked for 1 hr 5 mins. The only thing I would do differently next time is using a little less sugar. It tastes just a bit too sweet to me. Thanks for a great recipe! Played around with recipe it worked a treat. Can't help but tinker! Used less sugar 175g; substituted 60g of flour with ground almonds; added chopped abate pear and freshly grated ginger with a bit of the crystalised stuff. thanks so much for this great recipe!!! I make a lot of carbonara, and have a ton of egg whites in my freezer. will be trying the plain version first and then another with some tweaks. once again, thanks for posting this recipe. I made it but my cake turn out to be chewy at the bottom. Why is that so? Happened upon your recipe and loved it! It reminds me a lot of pound cake only lighter. I did cut back on the sugar a bit and added some vanilla. I can't wait to play with this recipe some more too, because I can tell it probably would lend itself to lots of other flavor variations. Thanks! Wish I'd found this recipe years ago! Only found it today as my freezer is on the blink and did not want to waste all of the egg white lake that was defrosting. We always have egg whites as my hubby loves to make savoury tarts like quiche and they always use extra yolks. No one likes meringues In the family and there's only so many macaroons you can eat. This is fab! A proper cake with lots of scope for variation. Will be making it again and again and coming back to this fab blog. Thanks! My dad's family is from Estonia (I guess that makes me 1/2 Estonian!) Anyway, I am going to surpise him with this cake for Father's Day! Can't wait to try it. Thanks for a wonderful post and a great use for all my egg whites! I fou d your blog through David's :). Don't use a tube pan, the batter just runs out. I don't have a bundt pan, so I used my tube pan and it didn't work at all. I'm can't wait to try this recipe as I have 7 egg whites left over from my custard bread pudding. Do you think almond paste would be good in this cake and if so, how much and how would I incorporate it? Anon. - I'd try without almond paste first - it's rather light mixture, so almond paste would weigh it down too much..
how can I make this without butter? would olive oil work. I gotta make a no egg yolk no butter and very little oil cake for a relative. Fabulous recipe. Thank you! I made a chocolate version which turned out well. When in the pan I stirred through a couple heaped tablespoons breakfast marmalade. When cooled I covered with chocolate ganache. Divine! Fancy an After Dinner Mint Mousse?